The Greene Turtle Lacrosse Club has been a community of teams for players and families who love lacrosse. Over three decades, the Club has remained dedicated to providing an environment of fun and learning – as we field nationally competitive teams with the highest respect for teammates, opponents, coaches, referees, fans and families. Our client wanted to move away from an outdated sports scheduling platform to a user-friendly clean WordPress design. We love WordPress because the theme options are endless, and it’s flexible enough to keep evolving with our clients’ needs. 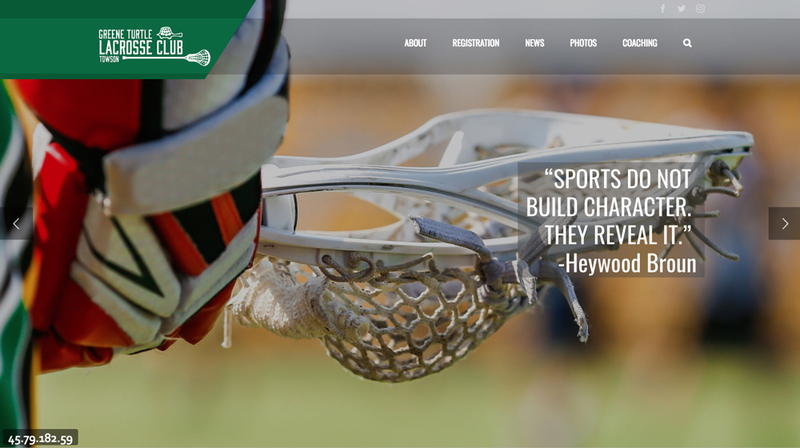 The Green Turtle Lacrosse Club wanted us to create a site that honors their lacrosse legacy of three decades, while staying current and highlighting the club’s latest news, upcoming registration dates, their coaching staff, and other news. By collaborating closely with The Green Turtle Lacrosse Club, we did a major website overhaul as we updated and reworked the website’s information to highlight The Green Turtle Lacrosse Club’s rich history and current events. We also revamped how the client shared news and handled registration. Finally, we created section all about their team, because after all: People do business with people. To keep users engaged, we included a mixture of content, including attention-grabbing icons, engaging articles, and big imagery. Check it out at The Green Turtle Lacrosse Club.